Last month I began a series of five monthly emails in response to questions I’ve received about my vision for the Oregon Synod. I started out with some “big picture” thoughts in February. There I spoke of a “convergence of opportunity, need and change” in the world around us. The ground rules for life really have changed. How we proclaim the Gospel in the midst of 21st century stresses is the question we must engage. This month I’d like to reflect on some of the amazing ways you are doing just that. I think of synod ministry in three dimensions. First, there is the day to day witness we give as congregations around the state. Then, there are new congregation starts created to meet contemporary needs. Finally, there is some really awesome, new work we do that may not even be on your radar screen. Let me say just a word about each of these. The vitality survey and visitation work we’ve done the past two years shows that some 20% of our synod congregations have really taken the bull by the horns and created new ministry models. The congregations of the Blue Mountain Cluster, for example, are deep into the work of creating ecumenical partnerships. Heppner is 20 years into shared ministry with the Episcopalians. Grace and Mercy in Hermiston, Christ the King in Milton-Freewater, and Zion in LaGrande are all exploring similar relationships. The Phase II conversations they are currently engaged in are focused around this work. Of course, we have many other congregations around the synod in ecumenical partnerships as well. Nativity Lutheran in Bend has a unique “Wood Lot” ministry (video). Several years ago, they realized a need for firewood among neighbors who heat their homes exclusively with wood. Last year they supplied 338 cords of firewood to 921 family units. More wonderful yet is that they have created a program through which those who need wood work side by side with church members to help others. This is the Gospel in action and the kind of partnership that makes a church flourish. Twelve congregations around the synod have been working together in a “New Beginnings” cohort putting small grants to work for grand schemes. They are now joyfully into a second year of mutual support, shared learning and companionship. Some of the projects are bearing fruit and some aren’t, but all of these congregations are sold on working together. Those who partner in significant ways know it makes a difference. And there is so much more. St. Mark’s in Portland is sharing their property with an affordable housing effort. Trinity in Gresham has partnered with a local nurse to help support foster children. In January Peace Lutheran/St. 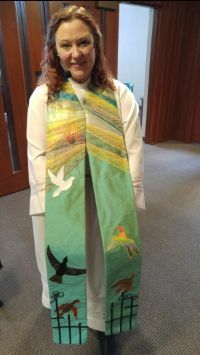 Andrews Episcopal Church in Burns celebrated their connection to the community’s biomass heating system. All work is God’s work, but these examples show the power of partnerships which are essential to proclaiming the Gospel in this day and age. New church starts are not what they used to be. I grew up as a member of Faith Lutheran Church in Seattle, WA. It was a post WWII, suburban expansion church start. After WWII we in the U.S. were making up for lost time. The “Baby Boom” began. New homes were built, and with them we constructed schools, clubs, roads and churches – everything people could want to get life back on track. Today we (all the various denominations together) have more church buildings than we can support. North Americans are less interested in formal religious affiliations then they used to be. The rural portions of Oregon need fewer people to support industry or farming – community viability is an issue. In urban areas waves of gentrification, relocation, urban blight and expansion – all of this – have made neighborhood churches a thing of the past. The result is that the synod spends much more time on current congregational sustainability issues than we do on new church starts. But, consider the following. Three years ago, we began a new Latino congregation in conjunction with the Episcopalians – Centro Montesinos in Woodburn. The pastor there is Fr. Agustin Valadez, and this is an exciting venture. Pr. Leo Bancroft is pastor of The Flame, a growing, intentional LGBTQIA+ faith community. Manuel Borbon is studying for ordained ministry, and at the same time a core leader in our Latino Ministry outreach. Several congregations in the mid-Willamette Valley and Eugene are working with Manuel to establish Latino ministry arms of their own. In Bend Pr. Erika Spaet, funded by both the ELCA and the UMC, is spearheading a new church start with unchurched and ‘de-churched’ individuals. We are blessed to be reaching out to people who identify differently than ‘traditional Lutherans.’ Much of this work is happening ecumenically, from the get-go. That’s different. And in the much different world in which we live, we are learning new language, becoming sensitive do different needs, and seeing the kingdom expand into corners of life we have not occupied much before. What a gift! You may not know that the synod currently has 15 (!) Domestic Ministry grants from the ELCA. These will bring $313,000 ministry dollars into the Oregon Synod for 2019. The four new church starts just mentioned are among these. Three other grants go for renewal programs in existing congregations. Another four support ethnic specific ministries; Living Water in Burns and Heavenly Peace, Good Spirit and our Cully ministries in Portland. Three other grants are more experimental engagements, primarily with younger individuals. These are Living Table, Wilderness Way and Together Lab. There is so much to tell here. Spiritual Theological Mutual Accompaniment (videos,) bringing pastors, priests, lay members, both Spanish and English speakers, Lutherans, Catholics and unchurched individuals from Oregon, Washington, PLTS, Mexico and Peru into common conversation. Can you believe that? The work we do all together. Really, it’s pretty cool!! Living at the “convergence of opportunity, need and change” as we do is not easy. Yet, we in the Oregon Synod have cleared the ground. Leaders talk about “holding sacred space” to see what it is the Spirit wishes to do through us today. Congregations – you – are creating new partnership and pathways with those around us. We are finding footing for new church starts once again, right here in our midst. And oh, the wonderful experiments in ministry we are about. What is my vision for the future of the Oregon Synod? This! Bonus Question: How would you give an amazing Children’s Sermon explaining why you got arrested?